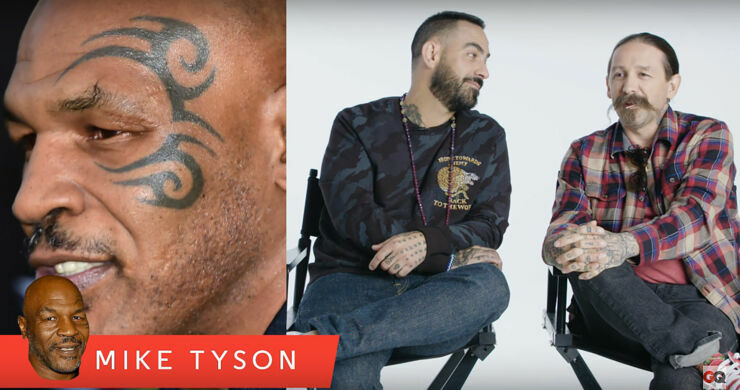 These Ink Master judges Chris Nunez and Oliver Peck take no prisoners when critiquing celebrity tattoos, and they're not your garden variety celebs either. They include A-listers such as Rihanna, Justin Bieber, Chris Brown, Nicki Minaj, and Mike Tyson—not the kind of guy you would really want to upset if you were mocking them. The video comes from GQ who asked the hosts, who serve as judges on Spike TV’s tattoo competition show Ink Master, to give their thoughts on celeb tattoos. And Chris Nunez and Oliver Peck don't hold back when it comes to the criticism. Especially when it comes to Justin Bieber, who they seem to take great delight in taking down. Bieber's take down is made all the more enjoyable because the Canadian singer seems to take such pride in his ink. But unfortunately the Ink Master judges have no trouble in giving his tattoos a less than favorable review. To be fair, a lot of the celebrity tattoos get quite a bit of criticism (however, Angelina Jolie's traditional tiger tattoo they really like though). For instance, the Ink Master judges liken Ed Sheeran's colorful sleeve tattoo to a child's Crayola drawing. While Cara Delevingne's lion tattoo on her hand is called a "mess" and a "turd smear." Here's some more quotes on celebrity tattoos from the highly critical Ink Master judges. "I did not know that Rihanna had a big crazy hand tat. I think it's better when it's done in henna, because then it goes aways." meows Peck. Ouch. “The one thing we know about Justin Bieber is that in all senses he has the worst taste imaginable." zings Peck. “So it does not surprise me at all that every tattoo he has is completely terrible. He's known for paying tattooers to come to his house and tattoo him so he can sit around in his underwear and not have to go to a tattoo shop." “This is the purest example of you just don’t care anymore.” notes Peck. While Nunez chimes in with. "I think face tattoos for people that are not fully covered, no matter how permitting the world seems to feel there are other cultures, other places where you're going to travel. And at points these things could be a hindrance or could be a problem. And I understand self expression, I got tattooed because at the time I wanted to be rebellious or I wanted to feel a certain way. But getting your face tattooed without a full body suit, is a bit much." That was long winded, but you can conclude that the Ink Master duo do not approve of Mike's face tat. Don't feel sorry for poor Justin, in the video below he gives the story behind all of his tattoos and it seems he loves all of them. After all, tattoos are a personal choice.